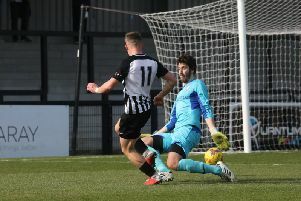 Andy Peaks believes AFC Rushden & Diamonds are still in with a chance of securing a play-off place, despite being held to a goalless draw by Royston Town at Hayden Road. Neither side could find a way through as a crowd of over 600 watched on during Diamonds’ Community Day, which also included the opening of the new stand at the ground before kick-off. Clear-cut chances were few and far between but the day ended with Diamonds three points off the play-off positions after fifth-placed Alvechurch secured a 3-1 success over Hitchin Town. “It was exactly what I expected it would be,” Peaks said. “It was a decent game between two good sides. There weren’t many chances, we probably had more of them but they probably had the better ones. “There wasn’t a lot in it as the scoreline suggests. It wasn’t easy because the pitches are drying up and it was a bit bobbly but I was pleased to see us trying to pass the ball. “We just didn’t quite deliver in the final third and we couldn’t find the breakthrough. I am a bit disappointed we haven’t picked up the three points but I was pleased with the general performance. “It’s a draw but when we look at the league table, are we out of it? No, we’re not. Diamonds can now look forward to another big game on Tuesday night as they take on Vanarama National League North side Brackley Town in the final of the NFA Hillier Senior Cup at Northampton Town’s PTS Academy Stadium.